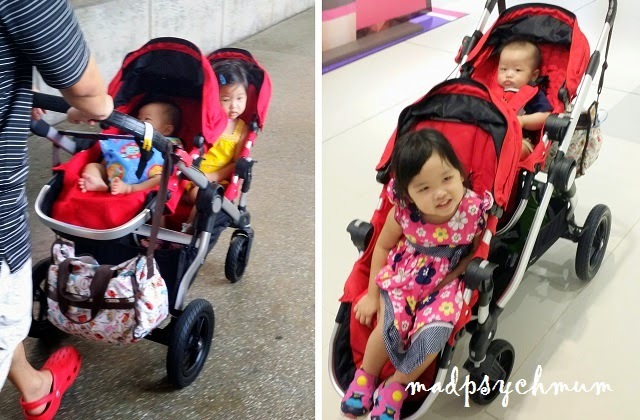 I've been dreaming of having a double stroller since I was pregnant with Baby Boy. Wouldn't it be cool if I can push both my kids on a stroller so that they will stop fighting over who gets to sit where. Of the Baby Jogger strollers (all of which have won numerous awards), the City Select was the one that I was the most interested in. 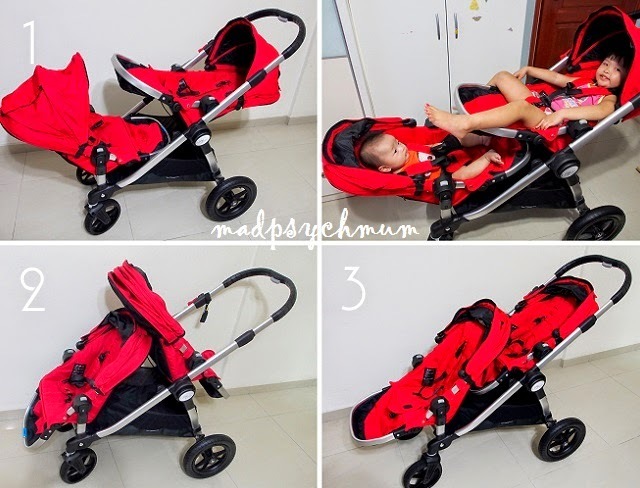 Its innovative multi-functional (I love things that can serve multiple functions) design allows you to choose up to 16 unique combinations of seating arrangement when used with an additional seat, car seat and conversion kit and/or bassinet (each sold separately). 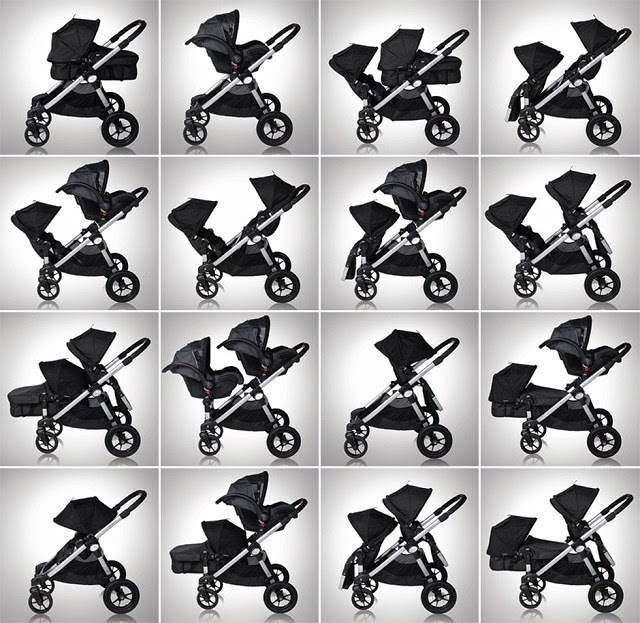 The City Select comes with the stroller frame, wheels, one seat and canopy, all packaged within a box. It was not difficult to assemble the stroller following the instructions of the user manual, which was pretty easy to understand. Comes with front wheel suspension and sealed ball bearings. 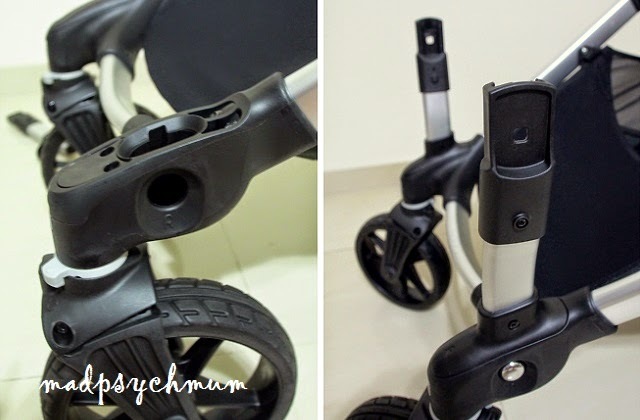 The swivel in the front wheels can lock into place if you are strolling for long distances. 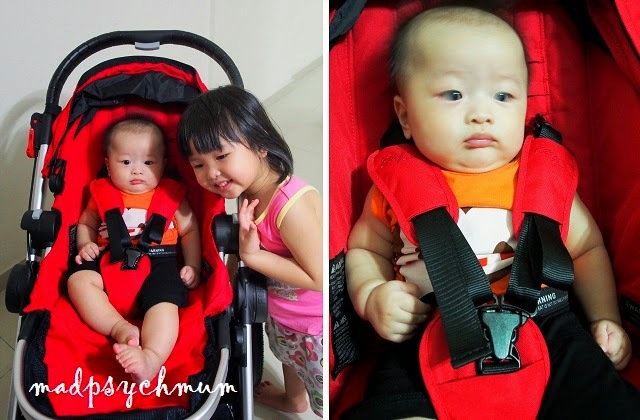 Sturdy and very stable, the wheels can handle the combine weight of 2 kids, up to a maximum of 40kg (20kg each). They look and feel just like bicycle tyres! The 5-point harness ensures the safety of your child while the "kid-unfriendly" buckle ensures that they stayed buckled up in the harness. Position it horizontal so that your child can sleep or position it upright so that your child can watch the world go by. I personally love the many recline positions of this stroller, which was lacking in our current umbrella stroller. The multi-position foot well also tilts up to add extra leg support for smaller children (like Baby Boy in the picture below). Comes with peek-a-boo window and adjustable head height. 2. There are magnets along the edge of the flap that adheres to the edge of the canopy to prevent it from flapping around in the wind. Pretty neat! 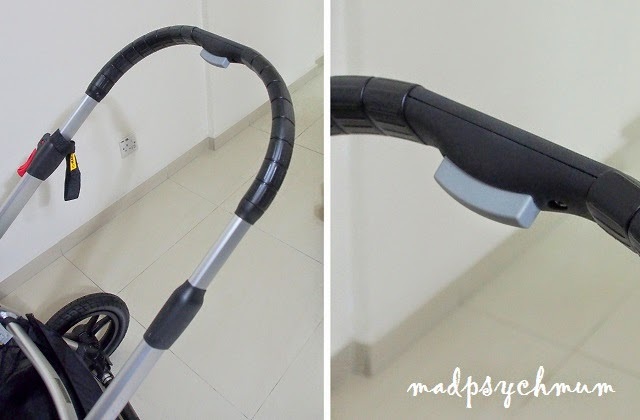 The handlebar can be extended with just a push of the button in the middle of the handle. 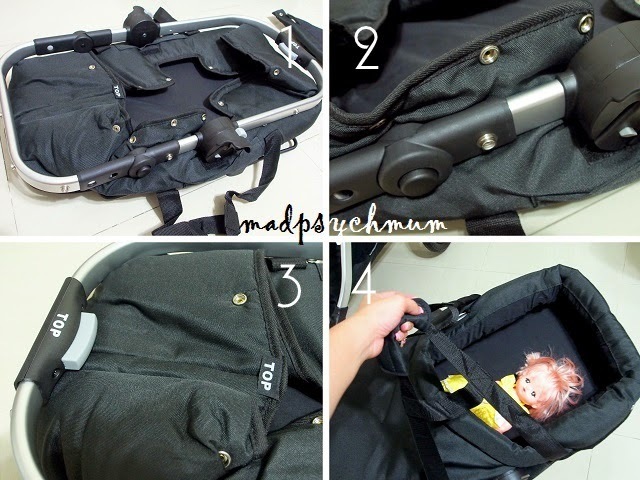 It is also great to grip when steering the stroller and can be wiped easily. 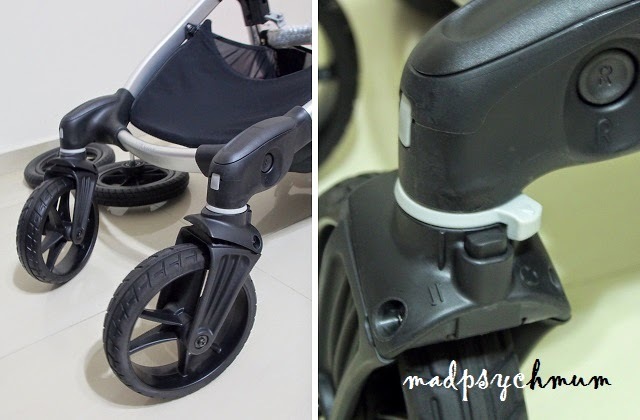 Unlike most strollers, the brakes are operated by hand rather than by foot, giving you more dexterity. 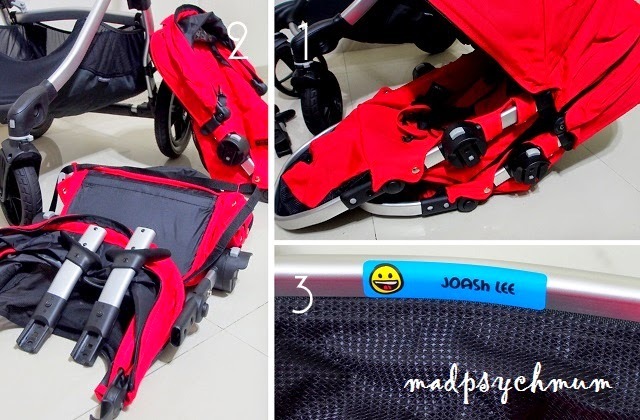 The seat comes with its own full canopy as well as a pair of metal seat mounting brackets which allows you to attach the additional seat to the stroller. You are now able to attach the additional seat to the adapters, thereby converting your City Select into a double! This is by far our favourite position as it allows us to see what our kids are up to. You can try out different combinations of seating arrangements depending on the temperament of your kids. For example, kids that fight a lot get to travel back to back while kids that get along (at least most of the time) can face each other. It is recommended that newborns (0-6 months) travel in a bassinet, which you'll have to purchase separately. You will have to assemble the bassinet by using the metal frame from one of your seats (if you have more than one). 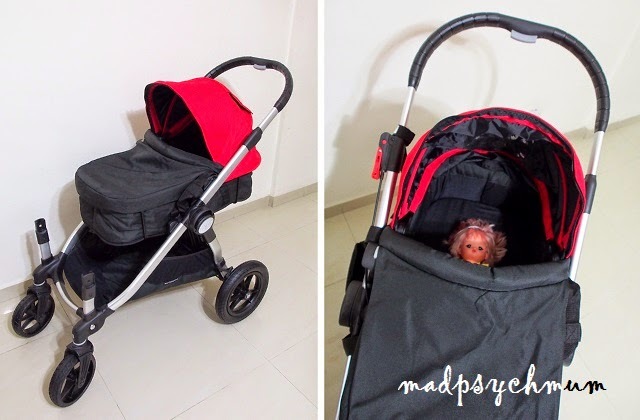 Attach the bassinet to the stroller like you would the seat and viola. There are 4 different combinations of seating arrangements that you can try with an additional seat, which is best for parents with an older and a younger child (not so good for parents with twins who are the same age and require the same seat type). The big stroller frame looks really difficult to keep but it's actually really easy. 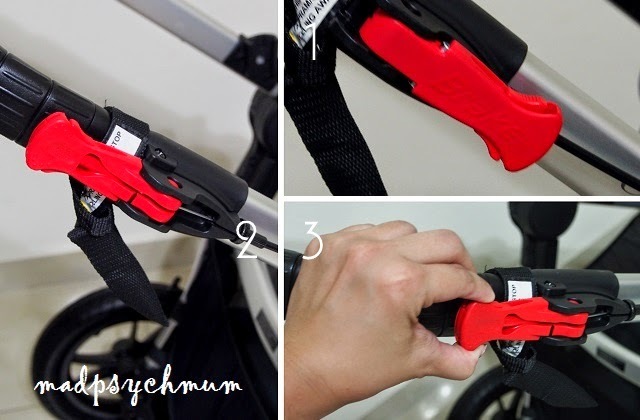 Baby Jogger's patented Quick-Fold Technology allows you to fold your stroller in just one simple step by lifting the "fold" handles. 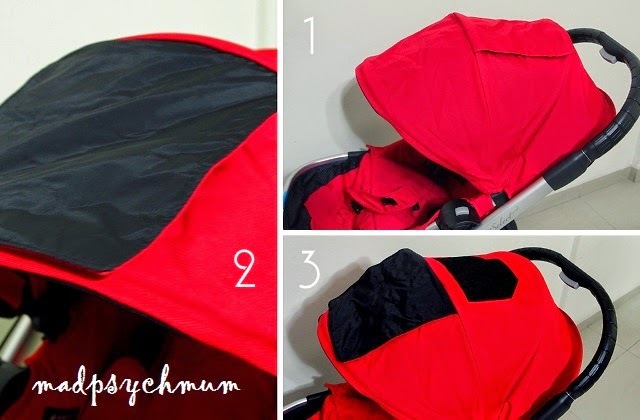 Having used an umbrella stroller for the past 4 years, the hubby was very apprehensive of the bulkiness of our City Select. 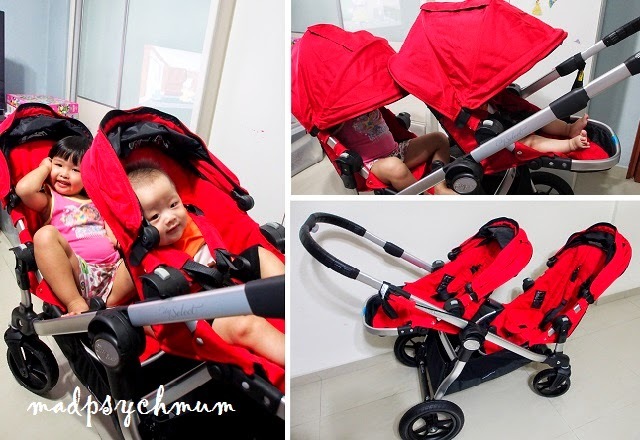 As it is a heavy duty stroller that is built to take the weight of two children of up to 20kg per seat (a lot more than umbrella strollers), the weight of the stroller is also double that of umbrella strollers (weight as a single is 12kg while as a double it's 15kg). The hubby was not sure if a bigger stroller like this would be easy to maneuver or if it could fit into our car. 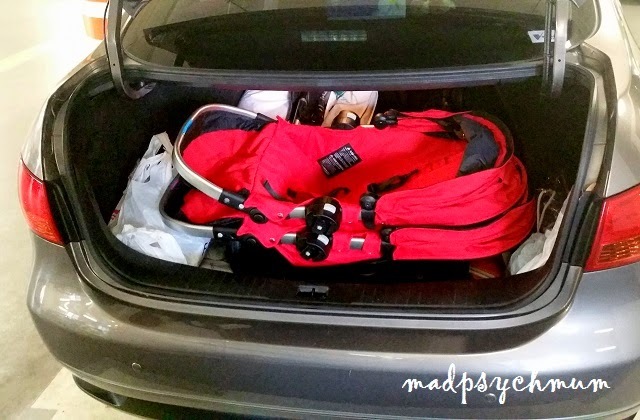 It took some rearranging but we managed to fit it nicely into our car with space at the side for other things. A tip from me: Stack the seats up and place the frame in first before putting the seats on top of the frame. For its size, the City Select is surprisingly easy to maneuver. 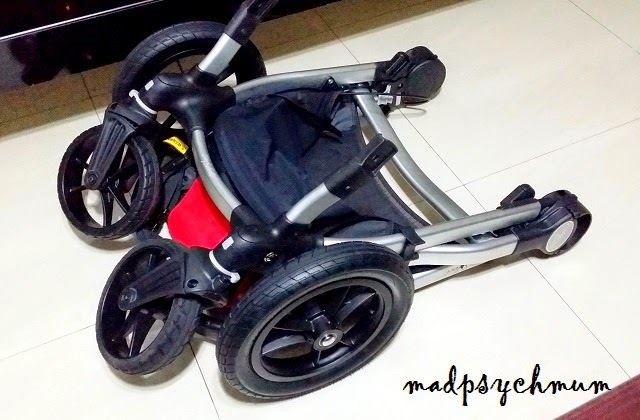 Keeping in mind that I'm pushing a load of almost 30kg each time, I found pushing the stroller relatively painless and definitely good for long haul travelling. 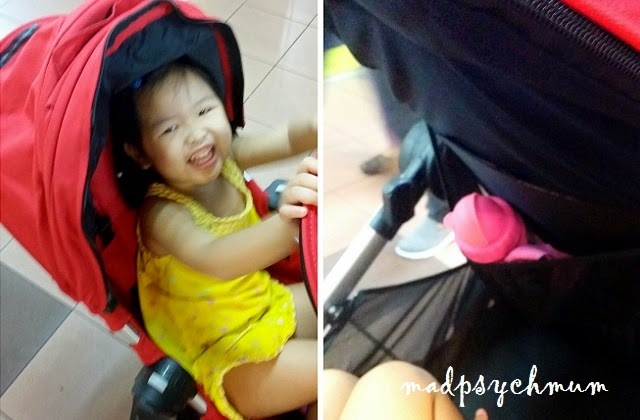 The most important thing is that my children really enjoy riding in this stroller! They don't have to fight over one seat and they can choose to face forward or backward. My girl especially likes the seat back storage compartment (of the seat in front of her since she rides in the back most of the time) where she likes to store her books and water bottle. "See ma, I can put my bottle here!" Other than the bulkiness and the fact that sometimes my girl's shoes might dirty the under-seat basket when she is seated facing the back, I'm enjoying the ease and multiple functions of our City Select. 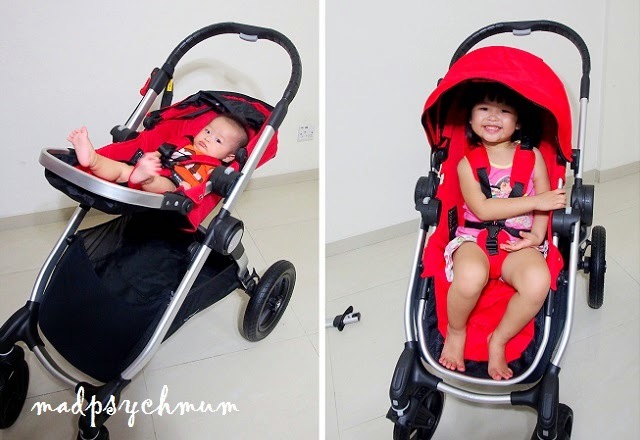 You can buy stroller accessories to complement your Baby Jogger strollers; for us, we'll most likely buy a travel bag to store the stroller when bringing it overseas with us on our trips. 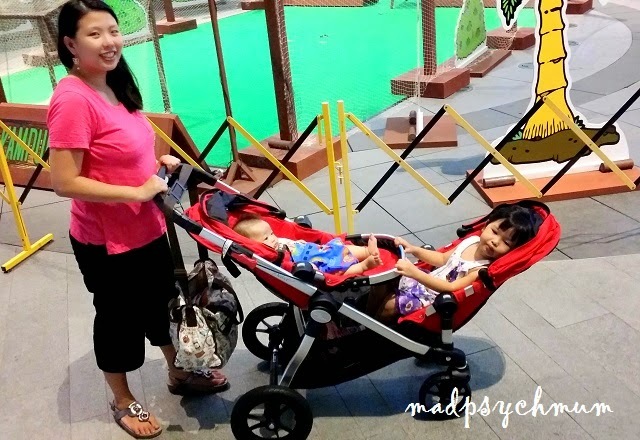 Baby Jogger City Select is available at various Mothercare and Mothers Work outlets in Singapore. Do visit their website and Facebook page for more information. 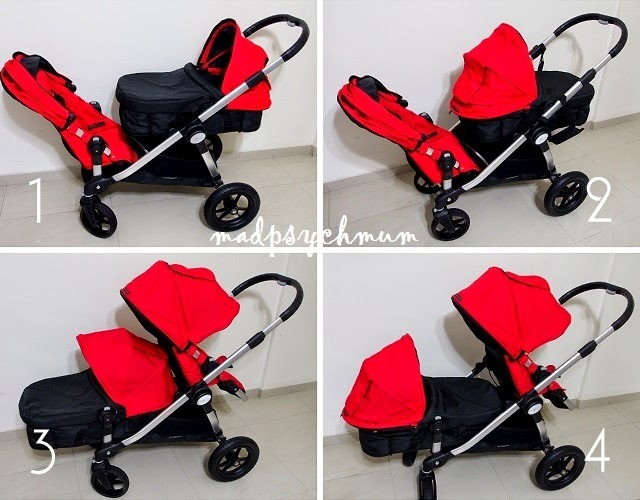 Disclosure: A complimentary Baby Jogger City Select and additional seat (bassinet was on loan) were received from Baby Jogger and The Amazing Baby Company for the purposes of this review. No monetary compensation was received; all opinions are my own.